It has been well over a month since my hen went broody and sat on 10 eggs in her chicken house. I suspect that the eggs are not viable so she is basically just sitting on a bunch of eggs we should have eaten. I will not bother her though, it is coming to winter and the other hen has almost stopped laying eggs, so no need to worry about egg production now. Eventually, if the eggs don’t hatch, the hen will get tired of the wait and leave them. Once they have been left for a couple of days I will dispose of them after candling them to see if there is any life within. Candling an eggs is the process of shining light through the egg so that you can see the inside. You can buy specific tools to do this, yet I just use a high power torch in a darkened room (such as the hen house). If the eggs hatch I will be happy, if not than it is no great loss. Probably means I might need some new hens and a new rooster when the new seasons roll around. Young Goose. It was her lucky day! The fruit trees in my garden are still being attacked each night, their leaves are being eaten away and branches are being broken. I have checked my electric fence to ensure that there are no issues with it, it seems to be working perfectly. I also did a couple of night time patrols of the garden, heavily armed with a torch. I didn’t catch any small prowlers. I coming to the conclusion that it might be the Geese doing all this damage. To this end I have decided to reduce the number of Geese that I own to zero. In all honesty, that isn’t the only reason to get rid of the Geese. They have turned out to be bad parents, by letting their young die. They are costing more to feed then the amount of meat they produce. They destroyed my garden (my fault for giving them the chance). We want less land, so no room for Geese. 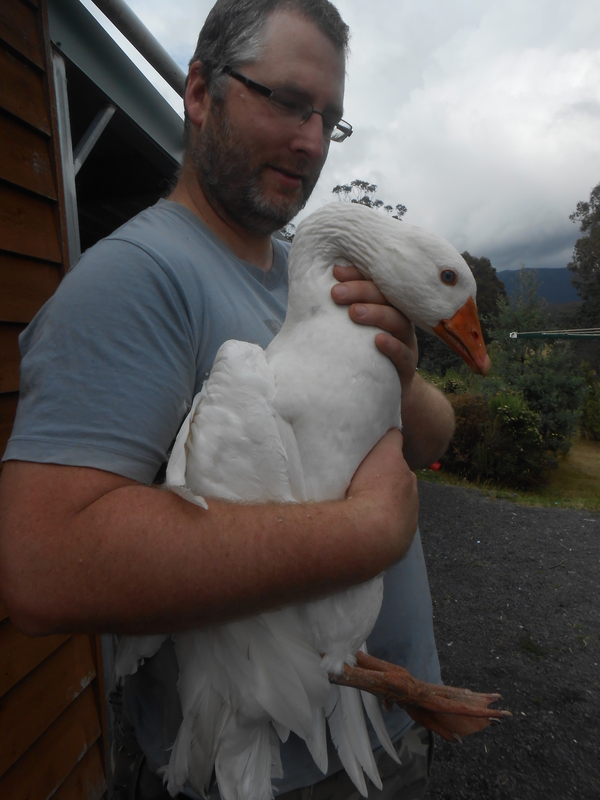 Anyway, I caught my youngest Goose to do first, as a friend wants to buy the meat from me. I found it to have very little meat on it’s body, which was a concern. I decided to let it go to get a bit bigger. 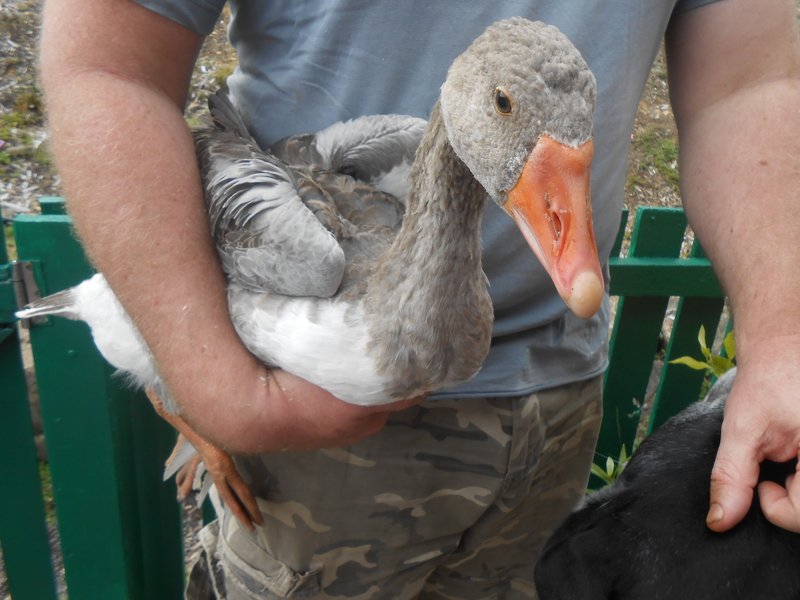 I then caught the white Goose, who was the odd one out. She is three years old, so might not taste too fresh. She was slaughtered humanly and the meat will go into the slow cooker at a later date. That reminds me, Kitty talked to one of our friends the other day who lives up here. Apparently he is at his wits end… he has lost nearly all his chickens to Tassie Devils and Quolls. He has had the branches of his fruit trees broken by Possums, he has lost lots of produce from his garden. Basically he is being overrun by animals. I thought that I might be able to assist him in some way so I stopped by and chatted with him. I mentioned that I heard of his plight and asked if I could help set up some electric wire to protected some of his things or help re-build his chicken house to protect against the murderous attention of the Tassie Devil and Quoll, and maybe work on fencing his garden to protect it. He seemed very appreciative of my offer, yet said he really just wanted to vent his frustrations to Kitty. Anyway, the point I want to make is to be sure to offer your support and assistance to your friends and neighbors. The simple act of Kitty to listen to one person’s problems made him feel a lot better.